Ask any programmer about their experience handling dates and timezones and they will probably share some war stories. Handling date and time fields is certainly not rocket science but can often be tedious and error-prone. There are hundreds of articles on the topic out there, however, most are either too academic, focusing on nitty-gritty details, or they are too patchy, providing short snippets of code without much explanation accompanying them. 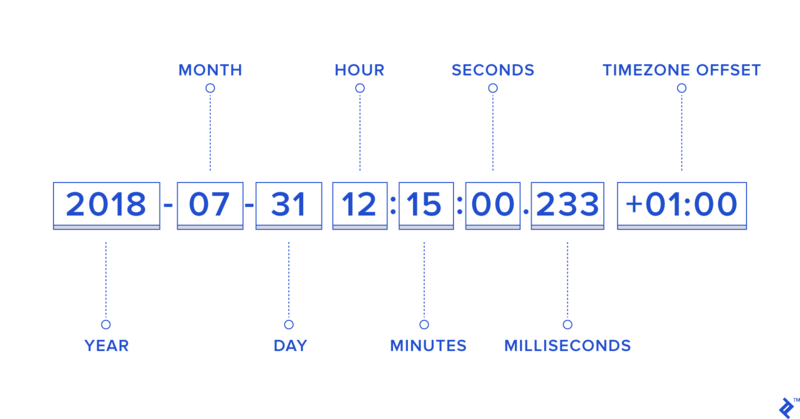 This in-depth guide to DateTime manipulation should help you understand the programming concepts and best practices relevant to time and date without having to browse through a sea of information on this topic. In this article, I’m going to help you think clearly about date and time fields and suggest some best practices that can help you avoid date time hell. Here we will explore some of the key concepts that are necessary for manipulating date and time values correctly, formats that are convenient for storing DateTime values and transferring them over APIs, and more. Date libraries help in many ways to make your life easier. They greatly simplify date parsing, date arithmetic and logical operations, and date formatting. You can find a reliable date library for both the front-end and the back-end to do most of the heavy lifting for you. However, we often use date libraries without thinking about how date/time actually works. Date/time is a complex concept. The bugs that come up due to its incorrect understanding can be extremely difficult to understand and fix, even with the help of date libraries. As a programmer, you need to understand the basics and be able to appreciate the problems that date libraries solve to make the most out of them. Also, date/time libraries can only take you so far. All date libraries work by giving you access to convenient data structures to represent a DateTime. If you are sending and receiving data through a REST API, you will eventually need to convert the date to a string and vice versa because JSON doesn’t have a native data structure to represent DateTime. The concepts I have outlined here will help you to avoid some of the common issues that might come up when doing these date-to-string and string-to-date transformations. A DateTime is a very specific point in time. Let’s think about this. As I scribble this article, the clock on my laptop shows July 21 1:29 PM. This is what we call “local time”, the time that I see on wall clocks around me and on my wrist watch. Give or take a few minutes, if I ask my friend that to meet me at a nearby cafe at 3:00PM, I can expect to see her there at roughly that time. Similarly, there wouldn’t be any confusion if instead I said, for example, “let’s meet in one and a half hours”. We routinely talk about time this way with people living in the same city or time zone. Anton tells me that he lives in the Central European Time Zone which is UTC+01:00. I live in UTC+5:45. This means that when it is 5pm where I live, it is 11:15UTC that translates to 12:15 in Uppsala, perfect for both of us. Also, be aware of the difference between timezone (Central European Time) and time zone offset (UTC+05:45). Countries can decide to change their timezone offsets for Daylight Savings Time for political reasons as well. This problem of managing two different versions of the time, relative to the user and relative to a universally accepted standard is difficult, even more so in the world of programming where precision is key and even one second can make a huge difference. The first step towards solving these issues is to storing DateTime in UTC. Standardizing the time is wonderful because I only need to store the UTC time and as long as I know the timezone of the user, I can always convert to their time. Conversely, if I know a user’s local time and know their timezone, I can convert that to UTC. But dates and times can be specified in many different formats. For the date, you could write “Jul 30th” or “30 July” or “7/30” (or 30/7, depending on where you live). For the time, you could write “9:30 pm” or “2130”. For 00:00 or UTC, we use “Z” instead, which means Zulu time, another name for UTC. We will use date arithmetic to solve common date related problems that most developers come across. My goal is to make you comfortable creating a date object from a string and extracting components out of one. This is something that a date library can help you with, but it’s always better to understand how it is done behind the scenes. Once we’ve gotten our hands dirty with date/time, it is then easier to think about the problems we face, extract the best practices, and move ahead. If you want to skip to the best practices, feel free to do so, but I would highly recommend you to at least skim through the date arithmetic section below. Due to differences between browser implementations and incorrect handling of DayLight Savings Time(DST), depending on the Date object for mission-critical applications is not recommended and you should probably be using a DateTime library like moment. If you don’t pass anything to the Date constructor, the date object returned contains the current date and time. If you instead want to get the current timestamp, you can create a new Date object and use the getTime() method. If you don’t intend to support <IE8, you can use Date.now() to directly get the timestamp without having to create a new Date object. Note that you do not need to include the day of week because JS can determine the day of the week for any date. However, you can run into trouble when you do not provide the timezone explicitly! gives you 25 July 2016 00:00:00 local time. If you use the ISO format, even if you give only the date and not the time and timezone, it will automatically accept the timezone as UTC. In PHP, the functionstrftime("Today is %b %d %Y %X", mktime(5,10,0,12,30,99)) gives you Today is Dec 30 1999 05:10:00. You can use a different combination of letters preceded by ‘%’ to get the date in different formats. The problem with this solution is that it can give an inconsistent length to the dates because some months and dates are single-digit and others double-digit. This can be problematic, for example, if you are displaying the date in a table column because the dates don’t line up. We can address this by using a “pad” function that adds a leading 0. The bigger point here is, once you’ve got the numbers extracted from the date, the formatting is mostly related to strings. Once you know how to parse a date and format it, changing a date from one format to another is just a matter of combining the two. The date formatting methods we discussed above should work in most applications, but if you really want to localize the formatting of the date, I suggest you use the Date object’s toLocaleDateString() method. gives us something like “26 Jul 2016”. Changing the locale to ‘en-US’ gives “Jul 26, 2016” instead. Notice how the formatting changed, but the display options were still kept the same. Pretty awesome, huh? It is a good habit to always pass the formatting options, even if the output looks fine on your computer. This can protect the UI from breaking in unexpected locales with really long month names or looking awkward because of short ones. If you want the browser to automatically use the user’s locale, you can pass “undefined” as the first parameter. On my computer, this outputs “7/26/2016”. If you want to make sure that month and date have two digits, just change the options. The original date object now represents a date 20 days after July 20th and newDate contains a localized string representing that date. On my browser, newDate contains “8/9/2016, 3:00:00 PM”. As with everything else related to date, comparing dates has its own gotchas. The variable result will have the value “not equal”. I’ve seen this example in lots of places, but I don’t like it because you don’t create a date object from another date object usually. So I feel that the example is important from an academic point of view only. Also, this requires both Date objects to be referring to the exact same second, whereas you might only want to know if they refer to the same day or hour or minute. Let’s look at a more practical example. You’re trying to compare whether the birthday the user has entered is the same as the lucky date you are getting from an API. Both represented the same date but unfortunately your user will not get the million dollars. This means, for me, new Date (“12/20/1989”) will create a date 1989-12-20T00:00:00+5:45 or 1989-12-19T18:15:00Z which is not the same as 1989-12-20T00:00:00Z in terms of timestamp. It’s not possible to change just the timezone of an existing date object, so our target is now to create a new date object but with UTC instead of local timezone. Create an ISO formatted date string from the user input date and use it to create a date object. Using a valid ISO date format to create a date object while making the intent of UTC vs local very clear. Remember: If the date constructor is passed a string in correct ISO date format of YYYY-MM-DD, it assumes UTC automatically. A common scenario you will come across is to find the difference between two dates. Convert both dates to UTC timestamp, find the difference in microseconds and find the equivalent days. Note: We have a non-standard format. Read the API doc to determine if this means 12 Oct or 10 Dec. Change to ISO format accordingly. I know there are more concise ways to write this code but I like to write it this way because of the sheer clarity of the logic. Now that we are comfortable with date arithmetic, we are in a position to understand the best practices to follow and the reasons for following them. If you are getting the date and time from the user, you are most probably looking for their local DateTime. We saw in the date arithmetic section that the Date constructor can accept the date in a number of different ways. To remove any confusion, I always suggest creating a date using new Date(year, month, day, hours, minutes, seconds, milliseconds) format even if you already have the date in a valid parsable format. If all programmers in your team follow this simple rule, it will be extremely easy to maintain the code in the long run since it is as explicit as you can be with the Date constructor. The cool part is that you can use the variations that allow you to omit any of the last four parameters if they are zero; i.e., new Date(2012, 10, 12) is the same as new Date(2012, 10, 12, 0, 0, 0, 0) because the unspecified parameters default to zero. Try to avoid creating a date from a string unless it is in ISO date format. Use the Date(year, month, date, hours, minutes, seconds, microseconds) method instead. In case you forgot, if you create a Date object with the input invalid ISO date format (YYYY-MM-DD), it will default to UTC instead of defaulting to the browser’s timezone. Always store the DateTime in UTC. Always send an ISO date string or a timestamp to the back-end. Generations of computer programmers have realized this simple truth after bitter experiences trying to show the correct local time to the user. Storing the local time in the backend is a bad idea, it’s better to let the browser handle the conversion to local time in the front-end. Also, it should be apparent that you should never send a DateTime string like “July 20, 1989 12:10pm” to the backend. Even if you send the timezone as well, you are increasing the effort for other programmers to understand your intentions and parse and store the date correctly. Use the toISOString() or toJSON() methods of the Date object to convert the local DateTime to UTC. Get the timestamp or the ISO formatted date from a REST API. Use the toLocaleString() or toLocaleDateString() and toLocaleTimeString() methods or a date library like moment.js to display the local time. When Should You Store the Local Time Too? “Sometimes it’s important to know the time zone in which an event occurred, and converting to a single time zone irrevocably obliterates that information. If you come across this kind of a situation, it would be wiser to save the local time as well. As usual, we would like to create the date in ISO format, but we have to find the timezone offset first. The Date object’s getTimeZoneOffset() function tells us the number of minutes that when added to a given local time gives the equivalent UTC time. I suggest converting it to (+-)hh:mm format because it makes it more obvious that it is a timezone offset. For my timezone +05:45, I get -345, this is not only the opposite sign, but a number like -345 might be completely perplexing to a back-end developer. So we convert this to +05:45. Now we get the rest of the values and create a valid ISO string that represents the local DateTime. If you want, you can wrap the utc and local dates in an object. Now, in the backend, if you wanted to find out if the event occurred before noon local time, you can parse the date and simply use the getHours() function. We didn’t use the tzOffset here, but we still store it because we might need it in the future for debugging purposes. You could actually just send the timezone offset and UTC time only. But I like to store the local time too because you will eventually have to store the date in a database and having the local time stored separately allows you to directly query based on a field rather than having to perform calculations to get the local date. Always configure your servers and databases to use GMT/UTC timezone. We have already seen how much of a pain timezone conversions can be, especially when they are unintended. Always sending UTC DateTime and configuring your servers to be in UTC timezone can make your life easier. Your backend code will be much simpler and cleaner as it doesn’t have to do any timezone conversions. DateTime data coming in from servers across the world can be compared and sorted effortlessly. Most of the code in the back-end should be able to assume the timezone of the server to be UTC (but should still have a check in place to be sure). Date manipulation is a hard problem, especially for beginners who don’t understand the fundamental concepts properly. Most of the existing material on the web is either too academic (going into excruciating details about quirks with timezones and DST that aren’t useful for most programmers) or too patchy (use this code and it will work). If you have any questions or feedback, let me know in the comments and I’d be glad to reply. It's good article about Date. Everyone who has encountered problems with conversion of dates, understand the complexities and subtleties. But in real projects it takes a lot of code. You can of course write your own class extending Date. But there are ready libraries that are perfected and tested over the years on many projects. I have not yet met projects, which would not use moment.js. I think it is also a strong side JS - the wealth of good libraries. What are the difficulties the author experienced when working with DateTime libraries? Punit! you are absolutely right, every programmer has faced or has been facing this date issue in his/her programming career. Your article is really very good enough for the programmer who has no idea about the date conversions and manipulation. Brilliant work on this article. Great article. Kudos! 1 small correction "Convert both dates to UTC timestamp, find the difference in microseconds and find the equivalent days." Actually you are finding difference in milliseconds. I felt that, actual soul of the article(Backend should have ISO formatted datetime and frontend should take care of converting the ISO format to user friendly local datetime) got lost into too many code snippets. EDIT: "Always configure your servers and databases to use GMT/UTC timezone." I think this is not needed. Because server will always going to receive ISO formatted date. Small, but important, typo. You wrote "...if you create a Date object with the input invalid [NO SPACE] ISO date format..." but meant "...if you create a Date object with the input in valid [WITH SPACE] ISO date format..."
nice read. But, there're some issues. for example, output of your first line of code `var date = new Date("July 32, 2016 15:00:00 GMT");` is wrong, at least on latest Chrome & Firefox. While it definitely don't throw an exception, but it sets the `date` to `Invalid Date`. I think what he means by configuring the server in UTC is that otherwise, if you were to create a new date you would have to explicitly tell your backend language (ie: php) that its a UTC. Same for the database, all automatically generated datetimes would be in something that is not UTC, which is a problem. I am happy the article is useful. Don't forget to use it as an educational content and use a library like moment.js whenever possible. There are many limitations concerning dates related to the tools and formats you're using. The most well-known limitation is the timestamp, starting at 1.1.1970. In many applications records have this date if the user never enters a date. The more time passes, the more the situation gets unclear and the more it's probable that the zero-value leads to confusion and is interpreted wrong. If someone is born on that day at 0:00 its probable that his birth-date-time will be interpreted as empty / not entered. There are still more limitations, depending on the years: 1900, 1000, 0, etc. If you have to deal with historic dates this is a big issue, as you've to program even Date-Objects new for some programming-languages and databases. So if you use libraries for those problems, look if the used date-objects are supporting the used dateTimes, else you directly can look for another lib. Concerning the limitations, the whole date-time issue is the biggest bug in the whole IT-landscape, no matter about programming language or kind of database. Hello, Is it posible to get the same date from another date field , just like inheriting the same date ? Hi Punit, Is that possible, I have a date like new Date('August 19, 1975 23:15:30 GMT+07:00') and I want to get zone name with country name like "America/New_York" ? Punit is an entrepreneur and software developer for whom versatility is his biggest strength. He has worked on a variety of projects, from real-time 3D simulations on the browser and big data analytics to Windows applications. He has also recently ventured into training on the MEAN stack.